Stylish and fun, this Anchor Hocking Oneida 98591CR2 38 oz. Heremes jar is perfect for your front of house displays. Use it to hold cereal, cookies, biscotti, and other homemade goodies. Or, use it back in your kitchen to store ingredients, such as pasta or beans. Whether you're using it for retail, storage, or to create eye-catching displays, this Heremes jar is sure to fit your needs. The crystal clear glass allows customers to see exactly what's in the jar, and the air tight, clamp top lid will help to keep food tasty and fresh. The Anchor Hocking heremes jars just can't be beat at this price. I have been collecting all the sizes and keep re-ordering more because they perform so well. They have an air tight seal that really works. Great for storing powders and different types of toppings for a ice cream or smoothie shop. We have 4 of these and they work great for our protein powders! Amazing quality. It is always a hit when we keep our cocktails garnishes in these. From Lemon and orange slices to straberries. Gives our bar a luxury look. A very useful and versatile product! I was happy with the size, shape, and capacity and the price is great for the size jar you are getting. I would buy this again. Ordered a number of these and one came broken. I emailed them, immediate response and a replacement one was sent immediately. Great service and response. Anchor hocking makes such high quality jars. This one is absolutely perfect for storing my honey, but I also plan to use it for dry goods like rice. The Anchor Hocking 98591CR2 1.2 Qt. Heremes Jar is great to fill with many things, like rubber bands or even candy. It looks great on a desk or counter top. The quality is excellent as well as the price. Highly recommend! I make my own facial scrubs and body scrubs and a ton of other home made beauty products. I love storing them in these glass jars. They stay fresh and look pretty on my bathroom vanity. I highly recommend these jars!! The lid feels solid and they have already out- lived the more expensive competition that I will never go back to using in our kitchen!!! We use this 1.2 quart glass jar to store our butter mints also bought webstaurant.com. This is elegant to look out making our butter mints a nice display. Anchor hocking makes some awesome quality glass items, this included. The jar is super thick with crystal clear glass. The square shape is fun and it seals up perfectly. This jar is great looking, i use to store tea leaves. Works well, and the seal is strong, would recommend to my family, especially for the price. Good jar for home made cucumber pickles, the latching mechanism can be a little hard to undo at times, because its a little thin, but its good for the price. I love using the stars to hold ingredients it makes things look super cute especially baking ingredients such as sprinkles and chocolate chips. I highly recommend these to organize your pantry or to just store anything . These are exactly what I was looking for. They are the perfect size to keep snacks airtight. Only negative is that I placed them in the dishwasher and ruined the metal hinges before I noticed that they aren't dishwasher safe... my fault. Love these -- perfect for quick pickling onions, cucumbers, peppers, etc. Can use them to make quick vinaigrettes or marinades. Super versatile and sturdy, seal is strong and they're easy to clean. I love these jars, we purchased a dozen of these for use at home and we will definitely be ordering more. They are the perfect size for storing chocolate chips, seeds, dried fruits, loose leaf tea, and things like that. They look nice and they keep everything fresh. Same complaint as with the 17oz size, my 1.2 qt hermes jars from anchor hocking did not seal well. The glass is nice and solid, but it did not fit the bill. I use mine to store dry ingredients. Has a nice tight fitting lid that helps keep ingredients fresh longer. Fits perfect inside my kitchen cabinet. 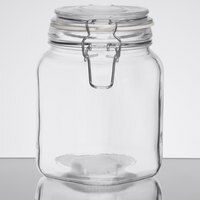 I ordered these jars in various sizes to complete a redo of my kitchen pantry. The price was an absolute steal, and not only do they work great and keep my items fresh, they look fantastic. I've been looking for glass storage for a long time, and am super happy with my purchase. The all arrived in perfect condition as well. I'm probably going to buy more. These are the best glass jars for storage...Pretty and practical! The rubber ring around the lid creates a tight seal and removes easily for cleaning...I recommend these jars in all sizes. So far I've use these jars at work as well as home and I absolutely love them as so do my coworkers. They are airtight and keep anything inside fresh. I purchased four these for use at home for my baking cocoa, baking soda, baking powder, and cornstarch. I love these products as they are air tight and keep my ingredients fresh. And thank you very much once again WEBstaurant store for the exceptional quality and pricing of your items. And I will definitely be recommending to all of my friends and family. The anchor jars are great for keeping items fresh. We use primarily for storing cereal, flour, sugar, and other ingredients used for baked goods. the jars are easy to clean-seem to hold up well when placed in the dishwasher. My pantry has never looked better. These jars have a gorgeous design, I love how they look on my shelves. They also have a really good seal and in a pinch I have used them to store soups, pureed tomatoes and pizza sauce which turns out is a great use for them. They preserve flavors of everything really well in the fridge. I actually prefer them to tupperware for liquids now. I recommend ordering several in different sizes, you will always have a use for these in the kitchen. We love these jars! They are a good value and look wonderful on our shelves. We use them to store dried spices and vegetables, loose leaf teas, and candies. I love using these jars at home! They are great for storing dry ingredients, snacks, and candy. The jars help to keep the products fresh and easy to access in my kitchen. Great value and price here as well! I have been using these jar to store dry ingredients that I have in my kitchen in large quantities. I store dry lentils, oatmeals, rice etc in these jars. They look amazing. They are 1.2qt. So they pretty big. I have also used it to store cooked soup when I was gone for a week. They soup was pretty fresh when i came back home. Of course I had let the soup cool down before i filled those jars and I also refrigerated the soup. I am not sure how heat proof these jar are because I have not stored any super hot food in it. They come in very handy. They make my kitchen look beautiful.. highly recommend. Awesome price. These are absolutely perfect for the sand ceremony sets that I use them for. What my customers love the most is that the hinge jar seals tight so that their sand stays in place. I was so thrilled to find a more inexpensive version of similar ball & wire jars for storing pantry items such as rices, flours, oats etc. Unfortunately one of these jars broke on the first use while washing (it seemed to have broken on the mold line). Perhaps a defective one. The remaining 15 I ordered have held up well. Thank you for your review! Please feel free to contact a Customer Solutions Specialist if you are ever unhappy with a purchase. Great container. Closes tightly no air. Good for candy, small cookies or just about anything else. Great price than anywhere else. Will shop here again. This is a lovely jar to keep homemade jam and other delicious concoctions. It's easy to clean, sturdy, and provides an air-tight seal in comparison to other products. This is a lovely, good quality jar. It seems to be of good quality and with a lid that snaps on tightly, sealing the contents. Low in price too.